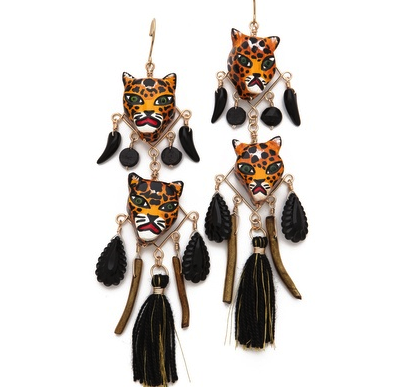 Extra-long dangle earrings make a whimsical statement with ceramic Leopard heads, soft tassels, and assorted charms. French hook. Mercedes Salazar started out designing jewelry from the dining room of her apartment, crafting accessories that embraced color and texture for a wholly original look. Never afraid to try new materials or source from new countries, Salazar’s pieces quickly became popular in the designer’s native Colombia. Today, the original 2-person enterprise has blossomed into Mercedes Salazar Jewelry, a company that employs more than 40 artisans and reaches the far corners of the globe.